The first true, dual-purpose haying and grazing varieties —varieties developed under intensive grazing practices to deliver high yields of high-quality forage regardless of use. The first commercial varieties with high levels of seedling resistance to Phytophthora and Aphanomyces—varietal traits that significantly improve seedling vigor and stand establishment, enhance yield, increase winter survival, improve pest resistance and improve persistence and forage quality. 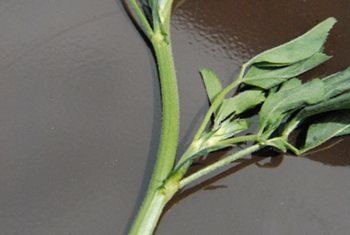 The first commercial varieties with true Lesion Nematode resistance - a long-sought protection from a traditional, profit-robbing alfalfa pest. The first commercial varieties with leafhopper yellowing resistance — a precursor to today’s efforts with glandular hair characteristics and other bred-in anti-leafhopper benefits. Selected for their yield and quality characteristics over the past decades, America’s Alfalfa® varieties produce agronomically-sound, winterhardy and disease resistant alfalfa. 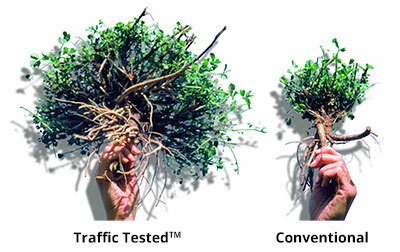 Varieties offer high quality, fast recovery and persistence. If you have questions or need further information, please send us an email or call Customer Service at 1-800-873-2532. America's Alfalfa, the America's Alfalfa logo, HarvXtra and the Traffic Tested logo are registered trademarks of Forage Genetics International, LLC. HarvXtra® Alfalfa with Roundup Ready® Technology is enabled with Technology from The Samuel Roberts Noble Foundation, Inc.
Genuity® Roundup Ready® Alfalfa seed is available for sale and distribution by authorized Seed Companies or their dealers for use in the United States only. This seed may not be planted outside of the United States, or for the production of seed, or sprouts. For the 2017 growing season, growers must direct any product produced from HarvXtra® Alfalfa with Roundup Ready® Technology seed or crops (including hay and hay products) to US domestic use only. It is a violation of national and international law to move material containing biotech traits across boundaries into nations where import is not permitted. Growers should talk to their product purchaser to confirm their buying position for this product. ALWAYS READ AND FOLLOW PESTICIDE LABEL DIRECTIONS. Roundup Ready® crops contain genes that confer tolerance to glyphosate, the active ingredient in Roundup® brand agricultural herbicides. Roundup® brand agricultural herbicides will kill crops that are not tolerant to glyphosate. Genuity Design®, Genuity Icons, Genuity®, Roundup Ready® and Roundup® are trademarks of Monsanto Technology LLC, used under license by Forage Genetics International, LLC. HarvXtra® is a registered trademark of Forage Genetics International, LLC. HarvXtra® Alfalfa with Roundup Ready® Technology is enabled with Technology from The Samuel Roberts Noble Foundation, Inc. Due to factors outside of Forage Genetics International’s (FGI’s) control, such as weather, crop production patterns, and other factors, results to be obtained, including but not limited to yields or financial performance, cannot be predicted or guaranteed by FGI. Results are based upon FGI controlled tests and field trials and public trials. Actual results may vary.